Mark Funderburk was played 1984 about as far from the majors as possible, in Italy. But, every night, he told The Orlando Sentinel the next August, he prayed he would get back. His major league career to that point consisted of just eight games played for the Twins in late-1981. But he spoke to The Sentinel in August 1985, when it appeared that his dream of getting back might just become a reality. "I'm a very religious person, and my faith in God helped me learn to be patient," Funderburk told The Sentinel. "It's given me inner peace. There were times when I thought about giving up, but then I'd say, 'The Lord gave me a talent, and I'm just going to keep on trying until I make it.' I think this time I have a good chance." And he did have a good chance. Within weeks, Funderburk was back in the majors, back in Minnesota. 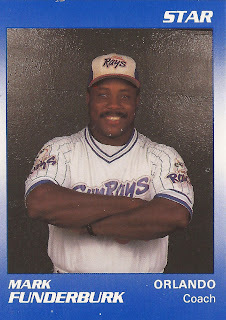 Then, for one solid month, Funderburk was a regular in the major leagues. Funderburk's career began in 1976, taken by the Twins in the 16th round of the draft, out of Louisburg College in North Carolina. With the Twins, Funderburk started at rookie Elizabethton, hitting high-A Wisconsin Rapids in 1977. He made AA Orlando in 1980, then AAA Toledo in 1981. It was in September 1981 that Funderburk made his first trip to the majors. He got into eight games, getting 15 at bats. In all, he got three hits. From there, Funderburk returned to the minors, playing 1982 back down in AA. After playing briefly with the Royals at AAA Omaha in 1983, he finished out that season in Mexico and played the next year in Italy. From there, Funderburk returned to Orlando. That's where his in-laws lived. His thoughts were baseball was over, and he would focus on his other love of carpentry, The Sentinel wrote. That's why he thought Orlando GM Bob Willis called him that off-season. "When I played here, Willis knew about my hobby," Funderburk told The Sentinel later. "I thought he was going to ask me to build something for him or the clubhouse." Instead, Willis was trying to build a team. He wanted Funderburk back to play. Back in the minors, Funderburk hit, and he hit well. By the end of the year, he was hitting .283. He also had smacked 34 home runs. He'd never hit so many in one season. And he hit well enough to catch the eye of the new Twins manager in Minnesota, Ray Miller, according to The Associated Press. "I looked at the stats and asked who this guy was," Miller told The AP. "I said, well, if he continues to hit, we'll take a look at him. Everybody told me he was an overswinger who was up here before. I said, 'He must not be overswinging now. He's not striking out.'" Miller spoke to The AP after Funderburk knocked in three runs in a late-September game at Kansas City. In all, Funderburk knocked in 13 runs that September. He also picked up 22 hits, including his only two major league home runs. Funderburk continued playing in the minors for two more seasons, but he never made it back to Minnesota. From there, Funderburk had a brief career as a minor league coach, spending 1988 to 1992 as hitting coach back in Orlando for the AA Twins, though he never made the majors as a coach. His job was trying to get young Twins prospects on to the major leagues. "There was never any question that Ray could hit. His hitting might even get him to the big leagues one day,'' Funderburk told The Sentinel of young hitter Ray Ortiz in 1992. "But the big leagues are full of DHs. . . . Ray is going to have to improve his play in the outfield if he's going to get there and stay there."